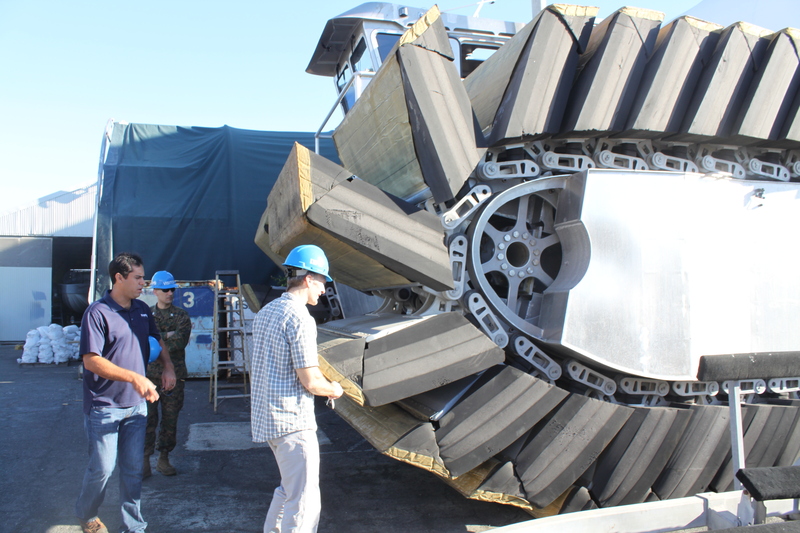 The Ultra Heavy-lift Amphibious Connector is being developed as a replacement to the LCAC, the Marines’ current ship-to-shore landing craft. A half-scale model, above, is currently undergoing an assessment in Hawaii. Photo courtesy David George, Ground Combat Element project officer, Marine Corps Warfighting Lab. Meet the Ultra Heavy-lift Amphibious Connector, or UHAC, currently being developed by the Marine Corps Warfighting Lab as a potential replacement for the Navy’s current ship-to-shore hovercraft. The photo above is just a half-scale model: a full-scale version will sit some 34 feet high and 84 feet long. The secret behind this machine is foam tracks with captive air cells, which allow it to propel itself through the water at up to 20 knots, and then move onto land. Because it has a very low ground pressure footprint–about one pound per square inch–it can cross marsh land and mud flats easily. The tracks can also crawl up a sea wall up to ten feet high. Marine Corps Warfighting Lab Ground Combat Element project officer David George inspects UHAC’s foam treads as Navatek mechanical engineer Gary Johnson and Marine Capt. James Pineiro look on. Photo courtesy David George. And the payload of the UHAC is huge: about three times that of the Marines’ current ship-to-shore craft, the Landing Craft Air Cushion. 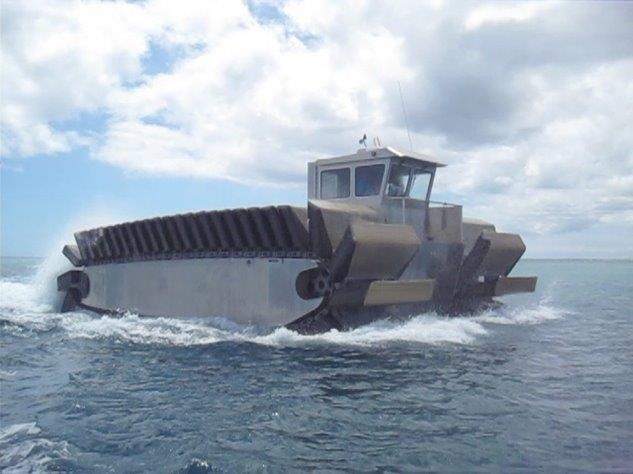 We’ll have the whole story behind this high-tech watercraft in our next issue of Marine Corps Times on Monday. Stay tuned. I don’t see the need for this, and wonder where the money that the Corps is spending on is coming from: the FY14 shipbuilding budget has over $4Billion over the next 6 years for an LCAC replacement called Ship-Shore Connector (also LCAC 1000). Seems the Marines could have other uses for their money. the Camp Lejeune budget ! the lcac has been quite good so far why make any new vehicle ,.just improve on the existing ones ,are they [the navy]going to make lcac’s transport ships bigger or wider to transport this thing? look the corps could use some help here yes but not with this thing ok money could be spent on a special ship just for the corps itself ok ,. has anybody ever thought of that? a special troop and vehicle made just specifically for the marine corps ok..
Obviously no designed to move to shore under fire, as there is no protection for the operator, even from a sniper. Is this paddle wheel another slice of PORK put into a defense approbation bill that no other service wanted so the powers to be said give it to the marines like the old MULE that the army didn’t want? Oh goody!. Another ridiculous pursuit of unobtainium by the authors of the EFV and 30 year deelopment of the V-22. How is that going to fit in an amphibious ship without smashing the undersdie of the flight deck? 34ft x 84 ft do you have any idea how much horsepower (fuel consumption) that will require to attain 20 kts with all the cargo the company ‘claims’ it can carry. I smell a wasteful science project and reminds me of a SNL skit with Christoper Walken and REO Speedwagon: “more cow bell!” In this case: More assault craft! Not because we need them, but bcause we deserve them. Can’t help think “Steamboat Willie” when looking at this monstrosity. The article is wrong about a number of points! It is not going to replace the aging LCAC, the Ship to Shore Connector will be that systems replacement. The UHAC is to replace the LCU with 3 times the capacity and the ability to be amphibious. I am disappointed in the quality of the reporting MCT! If it carries 2x as much, but takes up 3x the space, are we really gaining anything? Seems like improving the LCAC/LCU would be a better way to go, financially and logistically speaking.